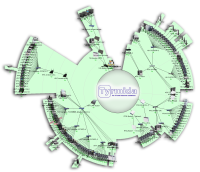 Tyrmida is your one-stop I.T. service provider. Our services cover everything from Web Hosting to On-Site Service Level Agreements and Customised Solutions. We pride ourselves on being at the top of our numerous fields and have built quite a reputation for being the people to talk to when you need to get something done. If you wish to find out more about our products and services, get a specific quote or get more information, we can be reached by navigating to the contact page.